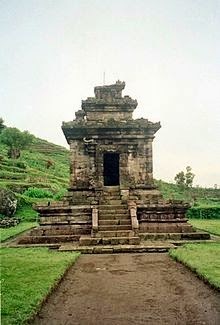 Gedong Songo temple (Candi Gedong Songo) is a famous tourist in Indonesia. You can decide to visit this place when you are visit to Indonesia. The temple is the one of cultural heritage hindu's temple. This Hindu temple located in Central Java, Indonesia. The site was originally built during early period of Medang Kingdom which controlled Central Java during the 8th and 9th centuries. Similar to Dieng Plateau, Gedong Songo was erected out of volcanic stone and the two complexes represent the oldest Hindu structures in Java. Dieng and Gedong Songo predate Borobudur and Prambanan. The temples of Gedong Songo reflect a similar architectural structure to the Dieng Plateau. However, Gedong Songo displays more emphasis on plinth and cornice moulding. At Temple 3, an entrance is outlined by a vestibule that is decorated by guardian figures. The Temple Located in the Candi village, Bandungan district, Semarang regency, Central Java, Indonesia precisely in the slopes of Mount Ungaran. In this temple complex there are nine temples. The temple was discovered by Raffles in 1804. Candi, Bandungan, Semarang, Central Java, Indonesia. The temple is located at a height of about 1,200 m above sea level so the air temperature is quite cold here (between 19-27 C). To enjoy the view of all temples, we can use two possible ways; the first way is by walking through the stony path from Gedong Temple I to Gedong Temple V, or by riding a horse through the opposite way. Besides the temples complex, in this location also has a hot water bath from a hot spring. Gedong Songo will be very useful for the community. The Temple has functionality in the field of education, culture, arts buildings, as well as research on geography, and facilities for recreation. Students and university students use this place as a vehicle to camp and put up tents. You need to make sure in a healthy and strong physically if you like to visit there. Therefore, the air at night is extremely cold and hazy. It is often also rain all of a sudden. So you must prepare for a complete equipment. For example, a light bulb lighting, health, jackets sweater, and umbrella. 0 Response to "Historical Place #5: Gedong Songo Temple"